Talk about a blast from the past! 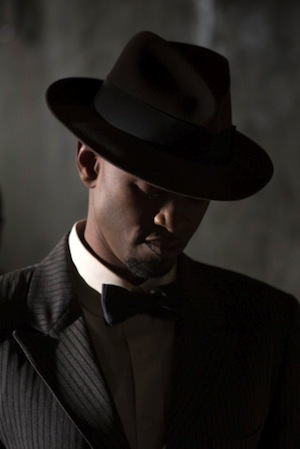 Klaus’ worst enemies have been resurrected on The Originals and bad boy Papa Tunde is just the beginning. As if the botched harvest spell last week wasn’t bad enough, we discovered on tonight’s episode of The Originals that is only the first of woes for the vampires. Turns out, Celeste has this mastermind plan to take down Klaus (Joseph Morgan), which includes bringing four really powerful witches back to life. Just when we think things have taken a turn for the worse, the shows veers off on another path that just proves we should have seen the glass as half full. First up from the grave is Papa Tunde. He’s sort of the godfather of all witches. 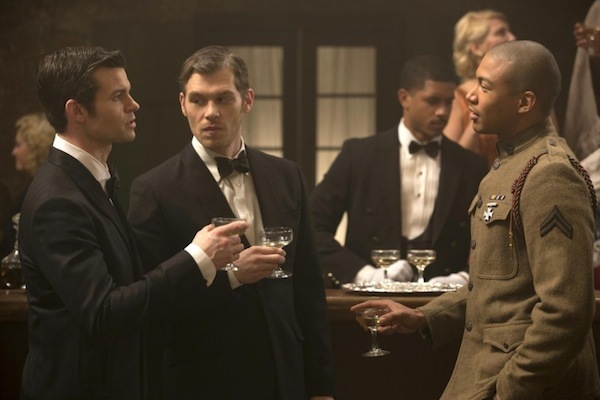 Or he was just after World War I, before Klaus killed him. Papa Tunde can become even more powerful than an original by using animal sacrifices to absorb the power from his victims. He has quite the affinity for snakes. He saunters back into town and starts killing vampires. The originals quickly recognize the spells Papa Tunde is casting from their tribulations with him before. Turns out, Klaus killed Papa Tunde’s sons before killing Papa Tunde with his bare hands, and now Papa Tunde wants to kill Marcel as retribution. Good thing Cami saves the day. No really, we aren’t joking. She’s back this episode and swinging bottles of liquor to save Marcel from the evil voodoo man. OK, so maybe she and Marcel aren’t friends yet, but it’s safe to at least call them drinking buddies after they drown their Davina sorrows together. There’s a good chance something else might blossom between these two. Just give them time. Especially since now more than ever things between Marcel and Rebekah (Claire Holt) are looking bleak. We really think she just needs to give up on him already. Can’t the girl just go for someone nice and normal? Let’s see some more Matt crossovers, right? Thierry is even let out of the garden and pardoned by Klaus. Just in time too since Papa Tunde kills all the other vampires in there to gain their power. Now it makes so much sense why Klaus let Tyler out on The Vampire Diaries last week. They couldn’t just let him die so easily when he’s been such a staple of the show since the beginning. In our weekly dose of Hayley (Phoebe Tonkin) and Elijah time, things are still steamy but stagnant. They’re getting closer and closer to true intimacy, I suppose. He did bite her this week, after all. But there wasn’t even any awkward tension around it. It was just a little nibble on her wrist. Done and done. What did get us in the chemistry department was the sharp dichotomy between the two when Hayley translated Elijah-speak. In his formal way he tried to describe why they couldn’t be together. Hayley ever so gracefully translated, calling Klaus a bad name and saying Elijah wants to be a good brother so they can’t hang out. It was kind of priceless. Those are the perfect moments when we adore watching the two together. At the end of the episode, Celeste asks Papa Tunde for the last sacrifice, and Papa Tunde willingly allows Celeste to slit his throat with his power-absorbing knife. Now Celeste holds all that vampire power Papa Tunde collected. But to what end? We still don’t know the extent of the game she’s playing. One witch down, three more to go. We have a feeling Papa Tunde was only just the tip of the revengenda iceberg.